The earliest buttons date to prehistoric times, and in spite of millennia of change in fashion and manufacturing techniques, the button has endured as the most common fabric fastener. Though buttons were used for thousands of years, the buttonhole was not invented until sometime in the 13th century. The buttonhole is thought to have been brought to Europe from the Middle East by knights returning from the Crusades, and its advent led to a surge in button use. Buttons became a staple of men's fashion in the Renaissance, when jackets often featured rows of buttons from chin to waist, sleeves were tightly buttoned from elbow to wrist, and trousers too sported buttons at the waist, knee, or thigh. Guilds of buttonmakers were in existence in Paris in the 13th century, where buttons were made out of a variety of materials including wood, bone, brass, pewter, gold, and silver. By the 18th century, the button industry flourished all across Europe, and artisans developed many different techniques for making them. The court of Louis XIV of France set the fashion for intricate buttons of precious metals and jewels and fabric buttons of embroidered cloth. English manufacturers invented steel buttons, and glass or glass and metal buttons were popular in France. Many artists famous in other trades also lent their skills to the button industry. The French painter Antoine Watteau made buttons, and some of the leading names in fine china such as Wedgwood, Limoges, and Staffordshire are also associated with fine buttons. By the late 18th century, buttons began to be made in factories. Metal buttons were punched out by dies, and die-makers were prohibited from emigrating from England, so that they would not take their trade secrets abroad. Nevertheless, the technology spread, and buttons began to be mass-produced in metal, glass, and other materials. Extravagant buttons were still popular elements of 19th-century fashion. Diemakers turned out complex designs using scenes from plays, novels, and nursery rhymes, and Wagner operas and the operettas of Gilbert and Sullivan were routinely commemorated with buttons depicting scenes and characters. plastic buttons: die cutting from cylinder-cast polyester. Buttons are still made from natural products, but these require more work by hand than do plastic buttons, and some formerly common button materials are no longer widely available. For instance whale ivory, elephant ivory, or tortoiseshell buttons cannot be made in the U.S. because of laws enacted to protect endangered animals. Horn buttons are made from cow and buffalo hooves and horns, but button aficionados claim that modern horn is of poor quality and color because the animals graze on low-quality grass. Antique horn buttons are often streaked and come in a variety of colors, whereas modern horn is a duller light or dark brown. Horn buttons are still an element of the best quality men's fashion, but they cost as much as a dollar a piece, compared to the half a cent price of a standard button. Mother-of-pearl buttons, derived from sea shells, are still prized for their luster. But after World War II, the divers in the South Pacific islands who provided most of the mother-of-pearls began to charge much more for their dangerous labor, and the price of the material rose drastically. Glass buttons, which were widely imported from Germany in the middle of this century, are now much less common as well. The glass buttons were factory made, but they required a lot of hand work under unpleasantly hot conditions, and this industry too dwindled after World War II. The common material for buttons is polyester, which is a special kind of plastic with properties that make it suitable for buttons. A variety of chemical dyes are added to the polyester to make different colors. To make buttons with the pearlescent sheen of shell buttons, red carbonate is added to the polyester. Black buttons are made with the addition of carbon black, and white buttons are made with titanium. 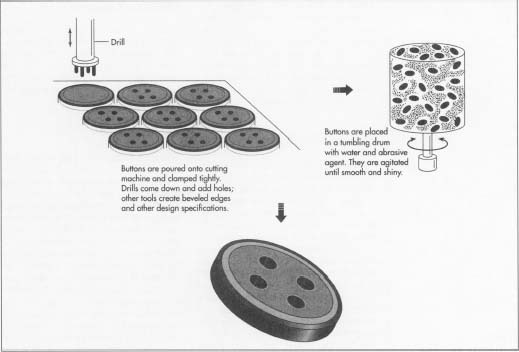 The button making process also requires a chemical catalyst that hardens the polyester, and wax. storage tank and measured into a stainless steel kettle. Then dye is added, if the buttons are to be any color other than the natural translucence of the polyester. After the dye is mixed in, the liquid polyester is poured into a 3-gallon (11 l) metal beaker. The catalyst and liquid wax are added. 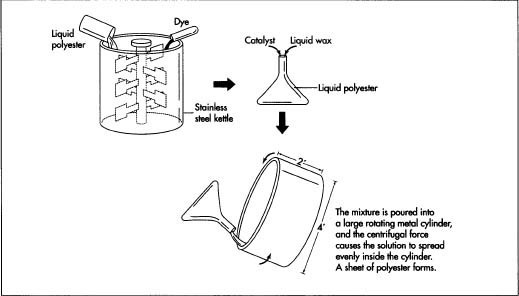 2 The mixture of polyester, catalyst, and wax is then poured into a large rotating metal cylinder. The cylinders are made of steel and lined with chrome, and are typically 2 feet (61 cm) long and 4 feet (122 cm) in diameter. The cylinders lie on their sides on rollers which rotate the drums at 250 rpm. The polyester solution is slowly poured into the rotating interior of the cylinder, and the centrifugal force of the rotation causes the solution to spread, lining the drum with an even sheet. A greater amount of polyester is used for thicker buttons, and less for thinner ones. A 2-inch (5 cm) lip around the ends of the cylinder prevents the polyester from leaking out. 3 As the polyester rotates in the cylinder, it begins to interact with the chemical catalyst and harden. 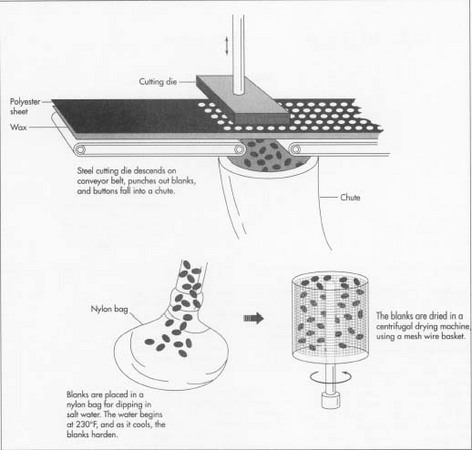 The wax rises to the top of the sheet, and also sinks to the bottom, so that the hardening polyester is eventually held between two layers of wax. This process is completed after 20 minutes of rotation. The resulting polyester sheet has changed from its liquid state to a crumbly solid likened to the consistency of stale cheese. 4 When the sheet has reached the proper hardness, the drum is stopped and the sheet is cut. Then it is rolled out of the cylinder onto a wooden tube. The wax makes it easy to remove from the drum, but the material is still very delicate. The top layer of wax is then peeled off, and the sheet is transferred to a blanking machine. 5 The blanking machine moves the polyester sheet along on a conveyor belt. As the sheet passes along the belt, circular steel cutting dies descend and punch out button-sized circles, called blanks. Buttons come in standard sizes, and different diameter dies can be loaded into the blanking machine, depending on the size needed. After the blanks are cut, they fall into a chute, and the punched out sheet of polyester rolls beneath the chute. Cutting the blanks from the sheet takes from two to four minutes, depending on the size of the buttons being made. 6 The blanks at this stage are hot, because the polyester is still reacting with the catalyst, releasing heat. So at this point the blanks are removed from the chute and poured into a nylon bag. The bag is then lowered into a tank of salt water, which is heated to 230°F (110°C). The blanks float in the salt water for 15 minutes. The water slowly cools, and the polyester blanks harden. Next, the nylon bag is transferred to a cold water tank, and the blanks reach their final state of hardness. After the hot and cold baths, the blanks are dried in a centrifugal drying machine, which spins them in a wire mesh basket. 7 The blanks are now ready to be cut into their finished button shape. The exact design of the button can be specified by a clothing manufacturer, and the button maker must make a steel cutting tool according to the design he is given. A different cutting tool is needed, for example, to make a beveled edge or a flat one, or to make a slightly concave button. When the appropriate cutting tool is in place, the buttons are poured into a hopper at the top of the cutting machine. The blanks fall into a holder where they are clamped tightly and moved toward the cutting tool. The spinning blade advances and cuts the button, then retracts. Next, the button moves beneath a set of drills, which create the holes. Like the cutting tool, the drills must be designed to conform to the clothing manufacturer's specifications. The design specifies not only two holes or four holes, but the diameter of the holes and the distance between them as well. After the buttons pass beneath the drill, they are sucked by vacuum out of the holder and into a box beneath the machine. Hundreds of buttons a minute can be made this way, though the number varies according to the size of the button and the complexity of the design. 8 After the buttons are cut and drilled, they have rough or sharp edges, scratches, and tool marks. They are placed into hexagonal tumbling drums, which contain water, an abrasive material, and a foaming agent. The drums spin for up to 24 hours. The buttons bounce around in the drum until they are smooth and shiny. After tumbling, the buttons are washed and dried. After the buttons are completely finished, they are placed on a conveyor belt and visually inspected for defects. The inspector must check each button for flaws and remove any cracked or mis-cut ones. The buttons are now ready for packaging and sale. The 20th century has seen entirely new clothing fasteners such as the zipper and velcro, and we can now manufacture stretchy fabrics that require no fasteners at all. Nevertheless, the button does not seem in danger of fading away. It is both utilitarian and fashionable, and will likely long be with us. However, button technology is not entirely staid. One recent development is a button of superior strength, a ceramic button made of zirconium oxide. Beer magnate Joseph Coors Jr. decided in 1989 that there was a need for an indestructible button, and he used a ceramics research unit at the Adolph Coors Company to develop this new product. The resulting Diamond Z button debuted in 1993. It is said to be harder than steel, with 2.5 times steel's flexing strength. These men's shirt buttons are fired at 3200°F (1760°C), then polished and coated with an ivory-like finish. The proof of the Diamond Z's indestructibility is a "drop test" where a heavy pointed rod falls down a long tube onto the button. The button can withstand this rigorous ordeal as well as the everyday wear and tear of repeated washing and ironing. The Diamond Z button is, however, quite expensive to make compared to the ordinary polyester button, and for that reason it is not likely to displace the existing technology. Epstein, Diana and Millicent Safro. Buttons. Harry N. Abrams, Inc., 1991. Fink, Nancy and Maryalice Ditzler. Buttons: The Collector's Guide to Selecting, Restoring and Enjoying New and Vintage Buttons. Running Press, 1993. Berendt, John. "The Button." Esquire, September 1989, p. 72. Coy, Peter. "Coors: From Beer to Superstrong Buttons." Business Week, July 12, 1993, p. 149. Very interesting and improve knowledge. I would like to more about the manufacturing process with cast rod instead of sheet.